"I want you to imagine a climber who is about to climb up a mountain, or maybe even just a climbing wall that is indoors." 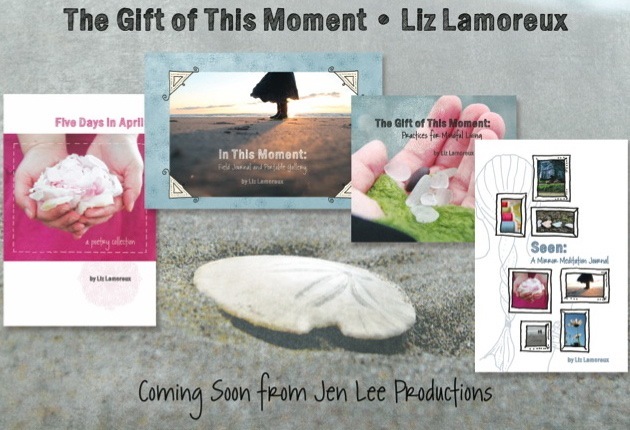 And so begins your invitation into The Gift of This Moment, a home retreat kit that includes practices for reflective living that have been hand holds for me on my journey. In this kit, I invite you to sink into my stories as though we are sitting together tucked in a cabin in the Pacific Northwest woods. And as you listen, you will begin to see how these hand holds can become part of your daily practice. But because we can't always be together tucked into a cabin, Jen Lee has helped me gather up all these pieces into a home retreat kit for you: no plane ticket required. "It isn't about finding the perfect solution to make life better. It's about practicing and just showing up, and the beauty that just showing up gives you." Next week, I'll begin looking at each piece of this kit to give you an insider's glimpse into why I believe these practices can give you the gift of getting to know the one person who knows you, who gets you, who can best support you: You. • "Rejuvenate. Reconnect. Retreat." Mini Black Tote . . . and more! Available now for pre-order right here. It releases next month, and I can't wait for you to hold it in your hands.